Today am sharing my CRISPY cookies RECIPE. The kids were on holiday and snack a lot apparently I was baking alot of snacks for them which I will share with you in another post .So on this very day, I decided to bake cookies, I got my RECIPE Manual and set out to bake. 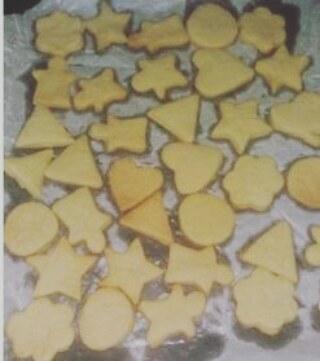 With the listed ingredients below I made a crispy cookies of different shape with its cutter. Sift flour and baking powder in a clean and dry bowl, add sugar, salt and combine. Add butter, egg yolk, vanilla. Mix with hand very well until fully combine add the water and fold in. Cover the bowl or rap the dough in a foil and refrigerate for 1 hour. Then flour your board pay the dough and spread it with the rolling pin and roll the dough until smoothly combined. Cut your desried cookie size and lay it on a baking sheet. Bake in a preheated oven at 190 degrees, max 20-25 mins or until golden brown. If you do bake this recipe, please can you share your experience with us?